I wasn’t planning on introducing this new notion for a few more weeks since it JUST came in and I have not even done an ad for it yet. BUT when I heard the customer service ladies raving over it I decided you all need to know about it NOW! 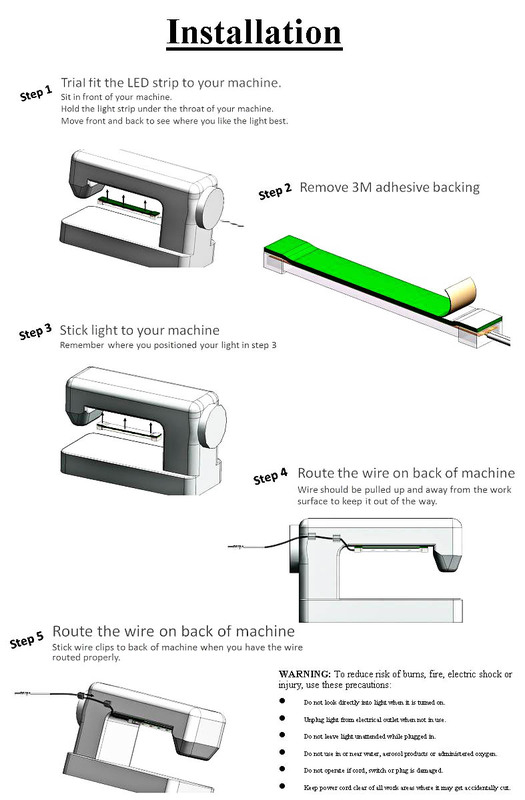 It is available in a 3 bulb, 6 bulb or 9 bulb strip depending on the size of your machine. 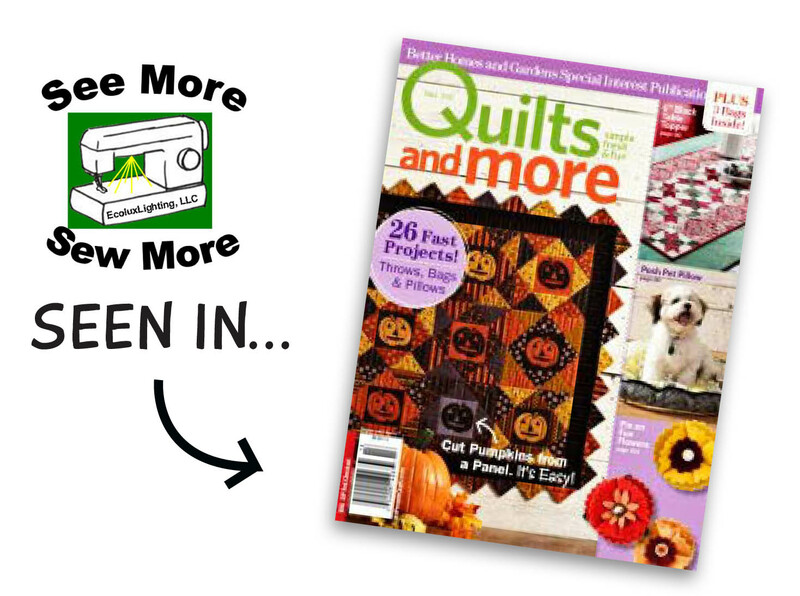 It was even in the Quilts & More Magazine…so you know it’s legit! * NO Batteries Needed! – Less than 1.3 watts of power compared to 100 watt light bulbs. *100,000 Hours of life on the light. *No bendable parts to get in your way. *Portable, unplug your power cord & machine is ready to go. *Designed specifically for quilters/sewers. LEDs are the best quality available. *True white vertical light illuminates entire work area & needle. And the installation looks simple enough. Next Next post: New Designs from Serendipity Studio! OMGosh….a have to have for sure! Hope it is at MKT. I will be 1st on line to get 1. But there are friends that must have this too. So I will be getting lots!! I need this and I need it now. I have an OttLite shoved up against the back of my machine now just so I can see. this would free up so much space! Thank you thank you thank you. I want one of these!!! Bet we don’t get them in the UK for another 5 years though… we always have to wait so long for everything that American quilters get! Goota have this for my mother. She says she needs more light the older she gets. Where can I get one? You can request these lights at your local quilt shop. We just got them in and they are available to ship pronto if your shop wants to order from us. I just have to get one or two of these babies!! The problem in my sewing space is lack of proper lighting, and when you have “older eyes” any little bit helps. When can we start ordering these lights. I need them avaiable in the shop soon. Oh I think we could all use just a little more light in our lives 🙂 This looks amazing. Wow, who couldn’t use this? It looks wonderful and I sure will looking for it soon. Thanks for telling us about it. I love this because often times if I use a lamp I find my eyes wearing out more quickly. This puts the light where I need it instead of shining it in my eyes like a police interrogation. WOWEEE! I need one of those! I really NEED this light – THANKS! This is fabulous! What a great idea. LEDs are such a clear, clean light. Way to go, Moda! I’m definitely going to have to get me one of these! Thanks for posting about it! Oh you are so right about the bright! I just love mine! OH MY GOSH! I MUST have one of these!!! 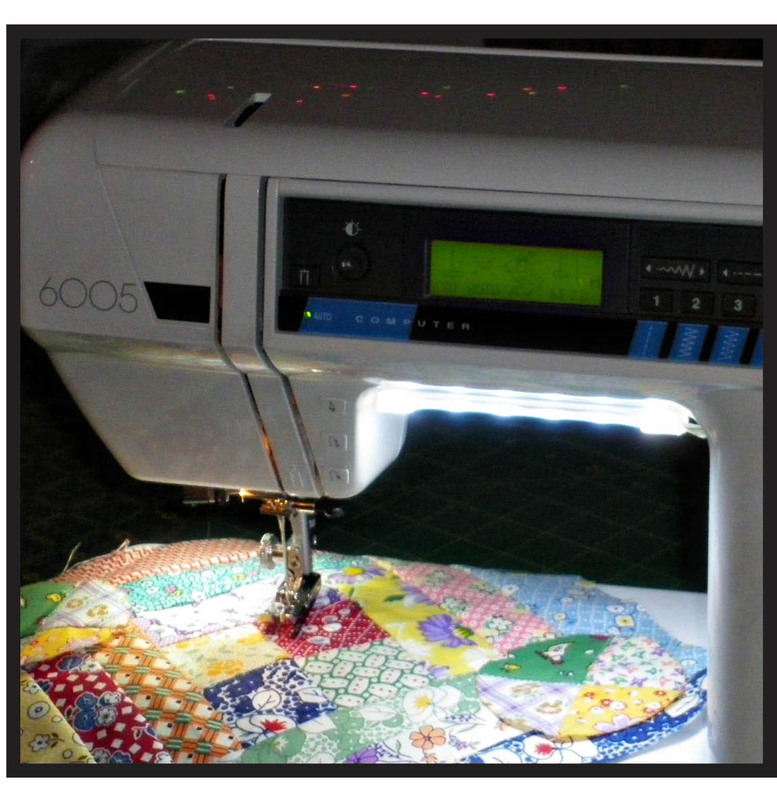 I have so many Ott lights surrounding my machine and still have problems seeing some areas while stitching. 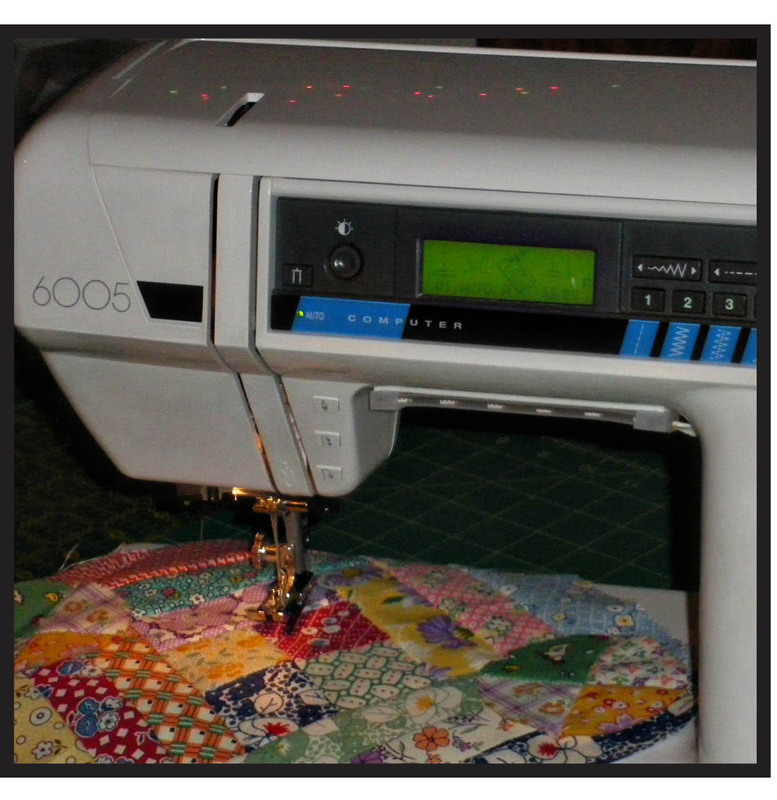 If I were to get one of these then I could use one or more of the three in total Ott’s I have all in that one area in different areas of my sewing room where I need more light. Oh this is so perfect. Yeah the Ott lights only help so much but this is right there exactly where you can’t squeeze that liitl ott in. Yeah for us more mature stitchers. Wow! What a fabulous product! I will need to get me one of these lights, the lighting where I sew is awful. Wow! This light is great. I have had one for over a year now and still love it. Go to: http://ecoluxlighting.com/index.html web site and order yours today, you won’t be disappointed. Where are these available to purchase? Thanks! I got this for christmas and love it, well worth the price!